Local Snowless Skiing Film: "Love Me Cinder"
New resort by Mt. 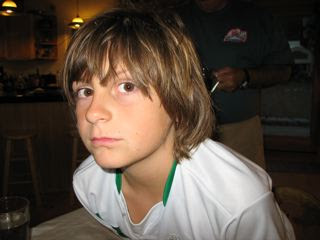 Bachelor? Forest Service Road 40/45: Skjersaa Rd. The conceptual thread linking Bend-based photographer Carol Sternkopf’s exhibition at Thump Coffee this month stems from two ever-vigilant characters from her youth: The Robot from the classic ’60s TV show, “Lost in Space,” and her mother Harriet. Both figures seemed to find “Danger! Danger!” everywhere. With the help of five Bear Creek Elementary School teachers and their classrooms, Thump Coffee owner Hazel Chapple presented the theme "On A Winter's Night, The Sky Showered Us With Gifts." 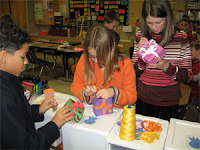 Students created wrapping paper and constructed the paper into small gift boxes. Then, each artist wrote about a non-material gift they wished to give to their family, school, city, country or planet. “Something to make someone else's life a little better,” Hazel explains. The gift boxes hang from Thump’s ceiling. Now through the end of February, the public is invited to come by Thump and create a new "Wish Plank" for 2008. Artist Mark Bernahl encourages people to take their new plank of wood home to work on it if they choose. The new wishes will be hung at the end of February. BEND, Ore. – December 14, 2007 – "Love Me Cinder," a locally-made movie about the adventurous sport of snowless skiing, is now available at Pine Mountain Sports. Filmmaker Jonas Tarlen of Bend debuted the short film at the Powder Hound Preview, which was held in the Tower Theatre on November 28. It was the second installment in Tarlen's snowless-skiing series. The first also debuted at Powder Hound, in 2006. "Jonas' cinder skiing film was, once again, the crowd favorite," said Dan McGarigle, owner of Pine Mountain Sports, which sponsors Powder Hound. "We had so many requests that we asked him to burn it onto DVD." Powder Hound is Pine Mountain Sports' annual "Welcome to Winter" party. Hundreds of locals pack the Tower Theatre to watch ski slideshows and movies made by locals. Organizers raffle off thousands of dollars worth of outdoor gear, and proceeds benefit Central Oregon Trail Alliance and Deschutes County Search and Rescue. This year's event raised $2500. (BEND, OR - December 14, 2007) Bend-based Borealis Resort Development announced today that it is partnering with Wildland Property, a global resort real estate brokerage based in Plano, Texas, to market and develop Borealis: The Village™. Located on 700 acres just three miles northwest of Mt. Bachelor, Borealis will be the closest community to the ski resort. Designed for today’s active lifestyles, Borealis Resort will link directly to the slopes of Mt. Bachelor via an extensive network of hiking, snowshoeing, and cross-country ski trails. This one-of-a-kind community will also feature a members' clubhouse, a 150-room hotel with 50 adjacent high-end cabins for overnight rentals, a spa, restaurant, meeting space, 379 single-family homes and 210 townhomes. Plans call for an 18-hole championship golf course surrounded by millions of acres of old-growth forests that boast sweeping vistas of icy volcanoes and alpine lakes. Additionally, Borealis announced that it selected Longmont, CO-based engineering firm Grand Shelters to help create the resort community. Grand Shelters designs are found in mountain locations worldwide. The firm is known for producing elegant structures based on the self-supporting catenary curve, the same architectural form and engineering principles behind the flying buttresses of Europe’s most splendid cathedrals. The resort’s name was inspired by the Aurora Borealis, or Northern Lights, which are a rarely seen phenomenon in Central Oregon skies. “This rare and special quality is perfectly appropriate to our unique vision for the resort,” Hillson remarked. Thanks to a wildly successful word-of-mouth campaign, Wildland Property has already begun accepting reservations from eager investors, and Borealis Resort Development plans to complete Phase I of the master-planned community by Spring 2008. For information, visit www.BendBorealis.com, call 541-815-0907 or email info@bendborealis.com. For real estate inquiries, contact Wildland Property at 972-607-9480 or email info@wildlandproperty.com. According to my colleague Anna Johnson at Descutes County, "Following the recent reconstruction of Forest Service Road 40/45, (also known as the Sunriver to Mt. Bachelor road), Deschutes County Commissioners are asking the public for ideas on what to rename the road." 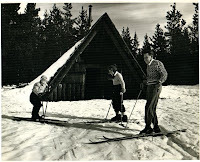 No other single family has contributed more to the development of skiing as an industry in Central Oregon than the Skjersaas: Nils, Olaf, Grace, Karol, Terry, Karen, Greta, Terry Jr. - all of these members of the Skjersaa family were champion skiers, ski industry pioneers, and visionaries who enabled the development of Mt. Bachelor and the ski industry as we know it today in Deschutes County. Most of them still call Central Oregon home. I can't think of a more fitting name for this road. photo: Skyliners Ski Club nordic team, circa 1930. Olaf is second from right, Nils is wearing #1 fourth from right. If you have any information about the Skyliners Ski Club - contact information for surviving members of the elder, "founding" generations in particular, family photos, stories, news clippings, etc., I would love to see and hear about it. Each fall NeighborImpact (formerly COCAAN), Central Oregon's champion for local economically disadvantaged people, hosts the Empty Bowls project to kick-off National Hunger and Homelessness Awareness Week. Hand-thrown bowls created by local artists for the event will be on display at Thump Coffee and available for purchase to raise funds for NeighborImpact's efforts. ONDA's annual Calendar Sale raises funds for the local non-profit conservation organization whose mission is to preserve and restore public lands East of the Cascade Mountains. Featuring gorgeous landscape photography donated by shooters such as Greg Burke, Jim Davis, Scott Erickson, Mike Henetz, Bruce Jackson and David Sherrill, 100% of the proceeds from the sale of these breathtaking calendars will go directly to ONDA when purchased at Thump Coffee. These calendars make a wonderful holiday gift for anyone who has never seen the stark beauty of Oregon's desertscape. 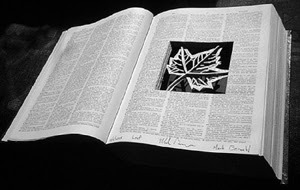 Local artist Mark Bernahl's "Altered Books" are showcased again this month. "I started sculpting into books partly because I am color blind and this limited the type of art I can make," Berhahl explains. "Plus, I always strive for making art that is beautiful and unique." Mark Bernahl's "Wishes" installation takes a bow to make room for Bend's young artists (see Bear Creek story below). Starting on First Friday and continuing through the end of February, people can come in to create a new "Wish Plank" for 2008. Artist Mark Bernahl encourages people to take their new plank of wood home to work on it if they choose. The new wishes will be hung at the end of February. This month Mark Bernahl's popular "Wishes" installation, which has been hanging from the coffeehouse ceiling since May, will be replaced by enchanting works from nearly 150 Bear Creek Elementary School students. When choosing a location for downtown coffeehouse Thump Coffee, one goal for owners Kent and Hazel Chapple was that the space allowed them to feature the work of young artists. "When I taught fourth grade at Bear Creek Elementary in Bend, it struck me that many kids had never been downtown or to Drake Park. They stayed in their area of town," says Hazel. "I wanted to give kids from varying neighborhoods and socioeconomic backgrounds a reason to come downtown — and I wanted them to realize that their art is worthy of being shared with the public." With the help of five Bear Creek teachers and their classrooms, Hazel presented the theme "On A Winter's Night, The Sky Showered Us With Gifts." Using a variety of printing techniques, the students created wrapping paper to decorate gift boxes (donated by The Foot Zone). Then, each artist wrote about a non-material gift they wished to give to their family, school, city, country or planet. "Something to make someone else's life a little better," Hazel explains. The gift tags are attached to each box, which will hang from Thump's ceiling, along with objects you might see in a winter night, such as stars, planets, snowflakes and moons. By displaying works by elementary school artists during the holidays, Hazel hopes it might "bring them and their families to witness something to be proud of, their work and their city." Her hope is to feature young artists annually, and to expand it to include more artists from grades K-12. 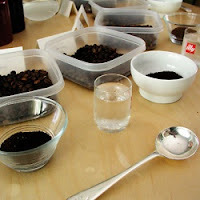 CUPPING: None this month, the cupper's on vacation. According to Stumptown Coffee Roasters, Finca Kilimanjaro is the first-ever grand prize winner in the history of the El Salvador Cup of Excellence: "Since her 2003 victory Aida Batlle has maximized the potential of her SL28 coffee trees (hence the reference to Mt. Kilimanjaro, one of the original planting sights of the famous seed varietal) through vigorous commitment to picking and processing. Her family's farm, purchased by her father Mauricio in 1973, is perched along the slopes of the Santa Ana Volcano in Central El Salvador. With altitudes ranging between 1580 and 1720 meters above sea level, Finca Kilimanjaro truly soars to heights above the rest. Finca Kilimanjaro's silken texture overlays flavors of red currant, cherry jolly rancher and rosé with a delicate perfume aroma." You’ve never had a pickle this good - Jackalope’s Beef Rouladen. So often we hear that location is everything for a restaurant. If it’s not in a good spot, death is inevitable once the initial curiosity has worn thin. Then there are those restaurants like Zydeco – perched between a car dealership and a fast food restaurant – and Kokanee Café – located in a beautiful setting, but an hour from most of the area’s population – that have defied that adage. Another of these location-challenged, but successful, restaurants is the Jackalope Grill, which I visited recently with a friend who had deemed it the best restaurant in the area. From a marketing standpoint, the strip mall location and commonplace bones of the space are big deterrents. Those same weaknesses become strengths when viewed through the lens of convenience. The restaurant is right off Highway 97 and offers ample parking. As a result, getting there can be less stressful and time consuming than dining downtown. Inside Jackalope, owner Kathy Garling has made the most of the interior. Charming and comfortable in a homey, unpretentious but upscale way, the acoustic tiles are partly hidden by drapes of gauzy blue linen and twinkly star shaped lights float over each table. Red and gold walls bring a soothing touch while tiny lights interwoven into the spiky snake plants make a clever privacy screen between the dining room and the entrance. Between the carpeted floor and the soft materials used throughout, the sound level stays at a comfortable din – busy and cheery, but never deafening. My dining companion and I found ourselves in a comfortable booth looking over the Jackalope Grill menu while the knowledgeable server told us about the specials. It was a Friday night, a little before the 7 p.m. dinner hour, but still the place was almost full; by 7:30 there was not an empty seat. We perused the 18-page, well-organized wine list emblazoned with the Wine Spectator Award of Excellence seal the restaurant recently received and decided to leave the choice up to owner Garling. The variety of wines is well rounded and at good price points ranging from $20 - $250. There is a balanced selection between the high cost and more economical wines, featuring some bottles I’ve rarely seen on other Central Oregon wine lists. After a quick description of what we wanted—a full, smooth red with a big finish—Kathy brought us a 2004 Chateau Pesquie Cotes du Ventoux Cuvees des Terressas from the Rhone Valley in France, a $29 bottle of wine with the distinct character and lushness of a more expensive bottle. Next came a salad my friend and I opted to split. Recently I have steered clear of salads, finding that many have been subjected to either a heavy or stingy hand in the dressing department. This salad, I’m happy to say, was perfectly dressed with a pear vinaigrette complimenting the Northwest flavors of field greens, blue cheese, hazelnuts and dried cranberries. The meal was nicely paced with a few minutes to sip wine between our salad and entrees. Stylishly plated, our entrees tasted as good as they looked. My companion’s Filet Mignon was beautifully rare with the right amount of rich, green peppercorn sauce brightened with a touch of brandy. I ordered a traditional German dish off the special list that I’d never tasted. Chef Timothy Garling rolls thin pieces of Oregon flank steak around bacon, onions and, yes, pickles to create a classic Beef Roulade. It sounds strange but it tastes great. The pickles add a bit of umph, but don’t take over. And bacon, of course, makes everything it touches that much better. Served with it’s own juices, a big portion of tender spaetzle and some tart red cabbage, I can’t think when I’ve enjoyed the lowly pickle as much. We finished our meal with a homemade macadamia coconut ice cream filled with whole nuts and creamy coconut milk, and a juicy pear tart with some of the flakiest crust I’ve ever tasted. You’ve got to hand it to any restaurant that can serve up an amazing haute Northwest cuisine experience while sharing a parking lot with Blockbuster Video. Once again Jackalope Grill has defied all adages and proves that location is less important to success than the overall experience. My friend and client, Bend artist Mare Schelz (Bonfire Glass Tile), just posted this video. She and a friend produced the clip - and a series of original silk-screened T-shirts - as part of a free speech project inspired by the Dixie Chicks-like protest by a team of women representing the United States at the world bridge championships in Shanghai last month. Thank goodness for the librarians, musicians, and yes, even bridge players who value truly American values, such as freedom of speech, above their own personal comfort and convenience. Agree? Disagree? Either way, it's our right and privilege to express freely what we think and feel. Read the 11/14 New York Times article, "Anti-Bush Sign Has Bridge World in an Uproar"
that by shopping here, you are making the world better. neighboring villages suddenly find themselves clean as well. fitting and proper that we try to right a few of these wrongs. The amazing thing is how both easy and wonderful it is to do so. Saturday and make a difference in the world. 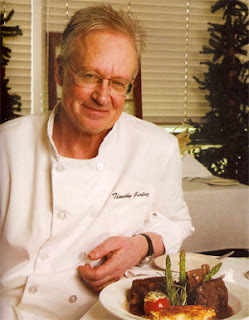 (BEND, OR) As famed British wine critic Michael Broadbent once wrote, “Drinking good wine with good food in good company is one of life's most civilized pleasures.” In this spirit, the Jackalope Grill’s Chef Timothy Garling has partnered with Bend WineStyles to present an Autumn Winemakers Dinner on Sunday, November 18. Starting at 6:00 p.m., a special six-course menu will be served with domestic and imported wines selected to pair perfectly with each dish. As each course and its accompanying wine selection are served, WineStyles owners Luiz and Jill Souto-Maior will discuss the wine, its characteristics and why it was paired with the dish. Cost is $85 including gratuity. Reservations are required, please call 541-318-8435. For information visit jackalopegrill.com or winestyles.net/bend. We are offering a special class where all proceeds will benefit Lupwa Homes. Malerie Pratt will join us to share her story and to answer any questions. Participants will create one or a series of postcards to send to the kids at the Vima Lupwa Home along with greetings. 1:00 -4:00 in the afternoon. Reservations must be made by Friday, November 9th. This is a charity class and registration will be done with Amy or Ellen at Container Antiques. Please call them to reserve your spot. Check payable to Lupwa homes due before class begins. Upon registration participant will be given a supply list. (BEND, OR) Kids can live out their Willy Wonka candy-making fantasies in Entrees Made Easy’s upcoming Kids Cooking Class. On Monday, November 19, from 12:00 to 2:00 p.m., aspiring chefs ages 8-14 are invited to make a mess in the Entrees Made Easy kitchen (while secretly learning real cooking and nutrition skills). Each young chef will assemble three ready-to-cook entrees to take home and share with their families. Kids can choose meals from Entrees Made Easy’s regular menu or from a selection of special Thanksgiving side dishes. Lunch will also be served, so parents can take a break to start holiday shopping or simply go out to lunch and relax. Then comes the candy making. An assortment of holiday chocolates will be explored and enjoyed, including pecan turtles, decorated chocolate-covered Oreo "pops" and other surprises. The only cost to participate is the purchase of the dinners: $58 for three half entrees (each serves 2-3 adults) or $88 for three full entrees (each serves 4-6 adults). To sign up, go to www.EntreesMadeEasy.com and select the Bend location. Kids love to cook. Especially when it’s a fun, interactive experience — and parents aren’t standing over their shoulders complaining about the mess. Kids Cooking Classes provide the opportunity for kids to expand their food preparation skills well beyond cold cereal and microwave popcorn. They learn all the steps of preparing healthy, fresh meals, and then they can proudly share their work by feeding the entire family. For more information, call 317-4159. 11/12 Jackalope Grill Cooking Class: "Hosting a Party and Enjoying It Too." Join The Jackalope Grill's Chef Timothy Garling for an evening of great food, wine and secrets for "Hosting a Party and Enjoying It Too." The class includes wine and hors d’oeuvres, demonstration and hands-on preparation in the kitchen, handouts with recipes and techniques and sampling of menu dishes paired with wine and/or beer. Hello. I entered a photo contest, and am in the top ten. If I win, I get a few grand in camera gear. When you have time, go here. And vote for your favorite. Mine isn’t wildlife, and is on page two. It’s called "God’s Lantern." When you vote, you’re entered to win some cameras and stuff from Canon. Of course, if you think another one is better, you should vote for that, but keep in mind I have guns. Anyway, vote for your favorite. (Bend, OR) Central Oregon Metal Arts Guild, COMAG , will host an opening reception for its 9th annual collaborative show, this Friday, November 2, from 5:00-9:00 pm at Saxons in the Old Mill next to the smoke stacks. The yearly show has evolved into a collaborative effort, where COMAG’s members team up with one another to create diverse works of art and jewelry in metal. COMAG members work is as diverse as the mediums in which they meddle. The group began as a handful of jewelers who found they spent a fair amount of time on the phone trading information about vendors, tools and techniques. This in turn led to a formal meeting time at local pubs, which in turn evolved into meetings that now regularly have attendances of over thirty interested metal artists. The members' mediums range from precious metal clay (PMC) to traditional jewelers, blacksmiths, bronze casters, metal fabricators and welders. Each sector represents a diverse group of gender, skill level and approach that when combined, provides for some creative solutions and possibilities. The group’s mission statement: “COMAG is dedicated to the promotion of education, information and collaboration in the metal arts and crafts.” All participating members will be on hand to speak informally about their finished pieces or techniques. 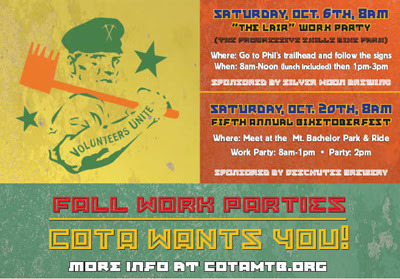 This will also be a great time to inquire about joining COMAG. So grab a friend and come on out and join us this Friday, November 2 at 5:00 for an evening of hors d'oeuvres, libations and art. The show will run throughout the month of November. 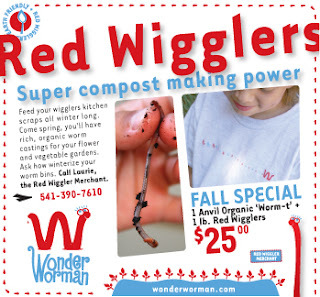 For information about COMAG, contact Steven Douglas. 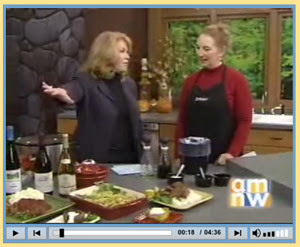 Karen Schmidlin, owner of the Entrees Made Easy in Hillsboro, made a guest appearance on KATU's "AM Northwest" program this week. She did a great job explaining the many benefits of the meal prep concept in general, as well as Entrees Made Easy's fresh difference. Click here for the Bend Entrees Made Easy page.